As described in the Psychopath Free book, psychopaths are first and foremost social predators. With no conscience, they’re able to use charm and manipulation to get what they want from others—whether it be families, friendships, relationships, cults, the workplace, or even politics. The bottom line is, they modify their personalities to become exactly the person they think you want them to be. And they’re good at it. Of course there are people who DO read too much into situations. The difference with psychopaths is that you’ll always discover you were correct in retrospect. They intentionally do things to make you feel on-edge or paranoid, like flirt with a once-denounced ex over social media for the whole world to see. When you question them, they accuse you of over-analyzing the situation. But then a month later, you discover they were actually cheating with that person. Psychopaths want you to doubt your intuition by making you feel like a crazy detective, constantly planting hints to make you feel anxious and then blaming you for having that anxiety. And yet, you’ll soon come to discover there’s more drama surrounding them than anyone you’ve ever known. Psychopaths will first idealize you above everyone else, praising you for your perfect easy-going nature. But because they are perpetually bored, this never lasts long. They are pathological liars, serial cheaters, and eternal victims. Before long, these qualities inevitably start to surface and cause you overwhelming confusion. Any time you mention your concerns or frustration, they’ll declare their hatred of drama and make you feel bad for reacting to their horrible behavior (instead of addressing the behavior itself). 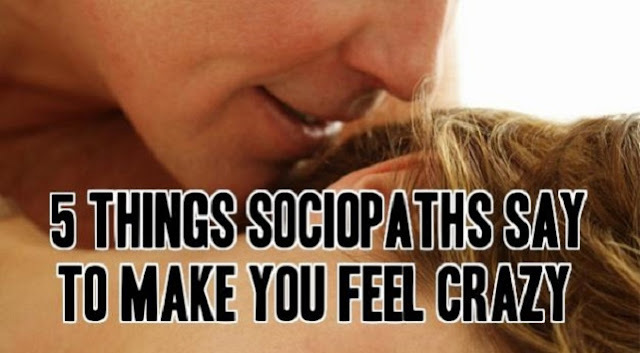 Psychopaths manufacture emotions in others—it’s what they do. After once showering you with 24/7 praise and flattery, they’ll ignore you for days on end and wait for you to react. When you finally do, they’ll accuse you of being sensitive or needy. They’ll insult, belittle, and criticize you (usually in a teasing/joking demeanor), pushing your boundaries until you finally speak up. Then they use your manufactured reactions to make you seem crazy. Within weeks, psychopaths can turn an exceptionally easy-going person into an unrecognizable mess of insecurities and self-doubt. Sure, healthy couples have misunderstandings and miscommunications all the time. But with psychopaths, they’ll intentionally say things they know will provoke you. Then when you react, they’ll turn it around on you and blame you for misunderstanding. Oftentimes, they’ll even deny that they ever said it. This is called gaslighting—blatantly doing or saying something, and then blaming you for misinterpreting it (or denying that it even took place). The fact is, you understood what they said perfectly fine. They’re just trying to make you doubt your sanity. The name-calling usually starts when things are going downhill fast. According to a psychopath, all of their ex lovers, colleagues, and friends are crazy, bipolar, jealous, bitter, or in love with them. This becomes very confusing when they start reaching out to those very same people they once denounced to you, using them to triangulate and cause chaos (making the psychopath appear in high-demand at all times). Then they toss you in that very same “crazy” bucket, continuing their never-ending cycle of idealizing and devaluing anyone unfortunate enough to cross their path. The only way out is to go No Contact. This means no texts, calls, emails, or even Facebook friendships. Otherwise you can be guaranteed that they’ll do anything and everything in their power to make you feel crazy. The good news is, when a psychopath tries to make you doubt your intuition, it means your intuition was causing them trouble. Psychopaths seek to psychologically destroy anyone who might threaten their illusion of normalcy to the world. So when they begin playing mind games with you, it’s actually a strange indirect tribute to your ability to notice that something was “off” about them.